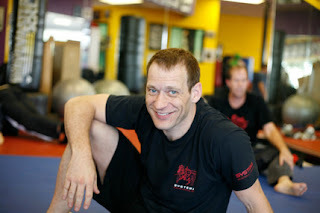 Martin Wheeler is one of the most visible instructors in the Russian Martial art of Systema who is currently active. He teaches world wide workshops, consults Special Response teams, choreographs, writes, produces and does stuntwork for films. His most recent job was being a stuntman for Richard Gere in the movie, “The Double”. Where did he come from and how did he get this far? Here’s the bio on his website. Born in England, Martin walked into his first training hall at the age of nine. One of his friends wanted to try a Judo class at the local YMCA in his home town of Paignton. His friends left. Martin stayed. At age sixteen he began training in the Hawaiian street fighting system of Ed Parker’s Karate, at the ‘doorman’s academy’ in the same town. Named because many of the local bouncers trained there he was introduced to Kenpo in bare knuckle sparring sessions. A year later he began working at the local clubs as a bouncer, a profession he continued for the next ten years in clubs from London to the U.S.
Twenty years later, after studying Boxing, Judo, Thai-boxing and Filipino weapons fighting Martin met Vladimir Vasiliev, the former Russian Special Operative demonstrating Systema at a seminar and knew he had witnessed something strange, unique and absolutely lethal in any environment. Moving and Striking– This involves the Systema method of strikes. It requires you to think “outside the box” relative to hitting. Groundfighting- Once again, the Systema approach is different, but not contradictory of what you see in MMA. Knife Defense– There is as much material devoted to the psychology and physiology as there is to strategy. What I liked- Pretty much everything. If Systema or Russian arts aren’t your thing,.. then don’t purchase them. Martin is a very, very, good communicator. He’s fit and not some fat guy bloviating theory. He has an outline and a progression. He strings together theory, application and anecdote. ALL three dvds are very well done. His offhanded comments about knife, groundfighting and attacks as a doorman are quite enjoyable. He doesn’t disparage other martial arts. He lets you view Systema as just another doorway to knowledge. What I didn’t like – Very little. Martin could have installed a pdf outline on the dvd. The liner notes on the inside cover are not detailed enough. Hopefully, Martin will do a dvd on handgun/rifle disarms. I like how he teaches. To view clips and buy these dvds,.. go to this LINK. For more clips of Martin, check these out. I listen to him often. His advice are great.